Thousands of women have banded together to post selfies to debunk the myth women who wear makeup are ashamed of their everyday appearance. Posting images of themselves with half their face made up and the other portion bare, the hashtag ‘PowerOfMakeup’ has demonstrated defiance towards those alleging they are victims chained to the beauty industry. 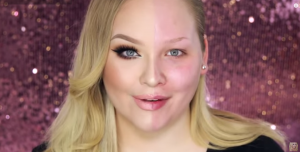 Vlogger NikkieTutorials started the trend in a video in May, posting it with a clear declaration: ‘makeup… is FUN’ [sic]. ‘I feel like lately makeup shaming has become a thing,’ Nikkie wrote. ‘It’s as if putting makeup on to have fun is a shame. Artists around the world began to chime in, proudly demonstrating their zits, dark circles and all the realities of being human alongside their intricate designs. As proponent Donna Bennett posted, it’s important to value yourself irrespective of which aesthetic you present in any given situation. ‘It’s all about how happy you are on the inside that counts most, and if drag queen makeup does that for you then bloody rock it out,’ Donna wrote on her Power of Makeup post. This entry was posted in Art, Life, News and tagged choice, makeup, makeup shaming. Bookmark the permalink.